Years of researches into the deconstruction of editorial policies of the media in Serbia with a lens on the visibility of women in different roles, but mainly in the role of a subject in providing information, have shown that women are not given equal visibility to men. That means that men are given more chances to speak and to be heard than women. That is the case even in the media contents of public service broadcasts even though national and provincial public broadcasters are required to take care of gender equality, gender-neutral language, women visibility in media and while reporting about women who are victims of a gender based violence, according to Law about public broadcasters (2014). The NSSJ researches showed that during the election campaign in 2016., a program of the national public broadcaster RTS and provincial public broadcaster RTV, only about 14% of sources were from female candidates. At the same time, in all media fields such as informative, sports, children, educational or entertainment programs, women are presented less than men. For example, in the sports program on RTS which is broadcasted daily, reporting about female sports players is deficient, even during considerable competitions in which our female sports players accomplished great results, did not go beyond 6%. On the other side, about competitions in which men participate is reported extensively, even if their results are subpar. Women, as a source of information are regarded when the topic of reporting is a part of what is typically considered as a ‘women field’ (culture, education, health care) or a ‘women role’ (for example they talk as a mothers, teachers). But, even in those reports they do not get beyond 20% as a source of information. Therefore, this brief review of NSSJ research results shows that the public media sphere (in the digital media as the traditional and even more) is a place of a distinctive gender discrimination towards women as subject and resource of information. Although the fact is that women are even a majority in relevant positions in the media (provincial public broadcaster RTV for example), that did not contribute to a greater women visibility in media and a more gender sensible editorial policy. 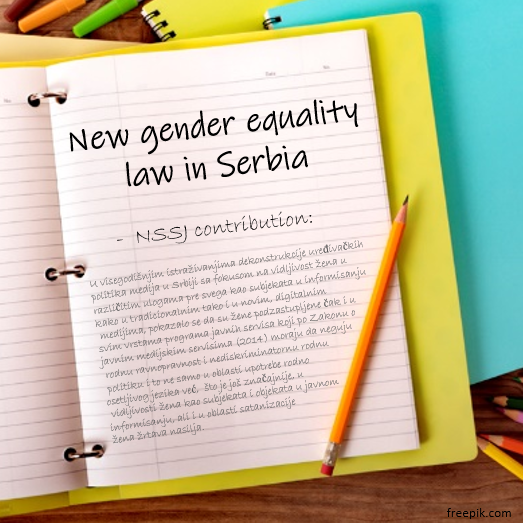 Because of that, NSSJ estimates that the new gender equality law must strive to influence that problematic field. During the public discussion of the script for the new law, this opinion of Novi Sad School of Journalism was sent to the Ministry of Labor, Employment, Veterans’ Affairs and Social Affairs.